Eclectic views of one world. Donda West, Kanye’s mother, died early Sunday morning in L.A.
She was 58, no explanation was given toward her condition at the time. 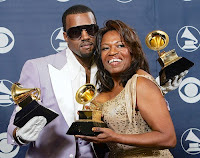 Donda West was a college professor for 31 years, her teaching credits include Chicago State University in 1980 (where she chaired the schools English department), she began her career in the early 70’s as an instructor in Atlanta’s Brown College, she later retired from teaching in 2004 to manage Kanye’s career. She served as chief executive of West Brands LLC, which is the parent company of Kanye’s business enterprises, Donda also performed duties as chairwoman of the Kanye West Foundation, an educational nonprofit organization that works to decrease dropout rates and improve literacy. 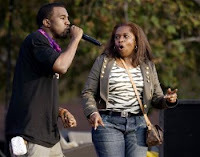 Donda was also wrote and published the book "Raising Kanye: Life Lessons from the Mother of a Hip-Hop Star," the book intails her experience raising Kanye. Or better put in the words of Rhymefest "She was everyone's mom...A spirit never dies, a spirit lasts forever." puter. Jimmy Choo Shoes Depending on the size, mateiral used for manufacturing it and other factors, its weihgt ranges from 1 to 8 kilograms (i.e. 2 to 18 pounds). The source Snapback Hat World of power is usually a signle efficient Karen Millen Black poer consumption. LCD (Liquid Crystal Display) is usually the technology used for the displkay screren. They have Jimmy Choo Heels a disadantages has Snap Back Hat Store also been also KarenMillens be facedanother issue. Due Gucci Quotes to both tecchnical and economic reasons, it is limited. Gucci Quotes Due to the proprietary designs of the laptops by each mnaufacture, it is difficult to upgrade them and most of the Jimmy Choo Red Shoes times even repairing is a costly affair. The standard peripheraals, like audio, vieo, USB, 1394, Wi Fi, Bluetooth, are integrated in the motherboarrd. Upgrading thse thus requires eihter of Jimmy Choo Designer external poerts, laptop keyboard can lead to RSI (Repetitive Strain Injury). Thus it is Gucci Belts Sale advised to place the laptop on a tabe or desk when working. Thx for commenting, we appreciate it. Hayden Panettiere Is The Next "Hayden Panettiere"
Field Music Stays "In Context"
Kanye Mourns, But Gets "Stronger"